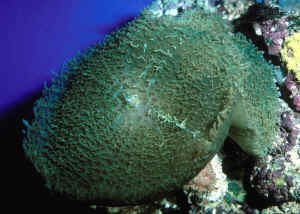 Coral anemones, mushroom anemones or false corals are perhaps the most celebratedly hardy "corals"; often reproducing readily in well-kept systems. They have much to their merit besides, being relatively inexpensive and available in reds, blues, greens, purples and variegated patterns. Corallimorpharians require little specialized care as you will see. 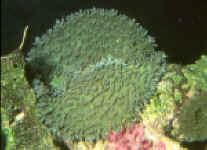 Class Anthozoa: Class Anthozoa: Polyp stage only, stomach divided in numerous compartments. Sub-Class Zoantharia (Hexacorallia): More than eight and multiples of six tentacles. 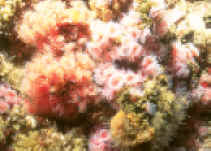 Order Corallimorpharia: Coral anemones. Solitary or colonial, flattened mushroom-like anemones. Short, stubby tentacles radially arranged. Look like true corals, but lack skeletons. About ten families. 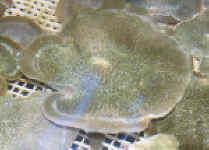 Most common genera Actinodiscus, Ricordea, Corynactis, Rhodactis, Amplexidiscus. 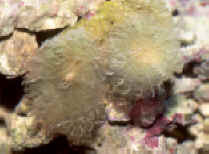 (the last two can eat unwary fishes... commonly clowns) Individual polyps 1 inch to 1 foot across. 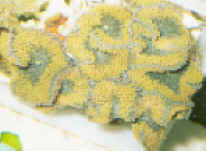 Stippled, smooth, to fuzzy and striped, the most common Corallimorphs comprise the genus Discosoma/"Actinodiscus"
Amplexidiscus fenestrafer Dunn & Hamner 1980. The Elephant Ear. Indo-Pacific. To about eight inches in diameter in captivity, two feet in the wild. These ones photographed off Pulau Redang, Malaysia. Below, In N. Sulawesi (Lembeh Strait); a close-up with a Pliopontonia furtiva shrimp on it. Monotypic genus. Corynactis californica. A cool to coldwater Corallimorpharian found off Mexico and the U.S. California coasts.